Should the passenger side not go to the rear of the strut like the factory one does? Or does it really matter? Looks like it may rub the fender liner the way you have it installed. No. Superpro specifically says it should be mounted on the front side of the strut mount. This is so the end link (which is thicker than the OEM one) doesnt cross over the axle and risk getting hit. I did notice that it makes very slight contact with the fender liner. Good eye! I'll figure something out for that. Ordered stoptech st-40 kit and ground control camber plates. Track season incoming hot. Interesting. I know I've seen the whiteline instructions before and they have you mount it to the rear, the same as OE. Brought my car to the dealership today for quite a few things. They said "an oil leak was found and it was a bad breather valve". Not sure if this was the PCV valve or why I had oil in my plug tube. Thermostat being replaced under warranty. Long story short, they're fixing as little as they can. Just another bad dealership experience. I love my VW's but I've yet to find a single stealership across three different states that hasn't tried to or successfully screwed me. Right. I read Eurocodes instructions and theirs is similar to whiteline - mount the passenger side endlink to the rear of the strut mount just like OEM which means you must make the endlinks equal length. In the end, I think it doesn't really matter whether it's mounted to the front or rear, as long as it doesn't hit the axle. I'm guessing VW engineered it this way so they could manufacture a single end link to save cost. Otherwise, they'd have to make a drivers side end link and a passenger side end link of different lengths. Last edited by fabric8; 03-28-2019 at 03:27 PM. Same here. Never smell coolant or notice any on the ground. Just ordered a new coolant reservoir cap to rule it out since they are so cheap and I’ll look underneath at the thermostat/pump in a couple weeks to look more closely for leaks. Also the headlights were doing a light show (all the different bulbs were flashing on and off in a random order, looked like a police cruiser haha). After getting it boosted most errors/lights cleared, went to the dealership (was covered by warranty). 2.5 years old and 51,000km. Yeah, mine scared the piss out of me with the "LOW COOLANT! STOP!" warning eventually and sure enough it was low. I had a feeling it was going down somewhere but wasn't sure. Noticed a bunch of caked on pink coolant residue on the front side of the oil pan though when removing my JB4 for this service though. Only other symptoms were a very barely visible smoke / vapor / mist at night in my headlight beams after a drive when the car was off and an ever so slight coolanty smell occasionally after a drive as well. This was Towne VW in Buffalo, NY. I've also had very mediocre experiences at Dorschel VW in Rochester, NY and Balise VW in Warwick RI. Dorschel tried changing prices after work was completed and lied to me about ordering parts for work and then never calling me back. Balise charged me to remove the tint from the car I was buying from them, then screwed up the removal by slicing my drivers door (didn't fix), and not removing all tint / adhesive from the windows causing $1500 of damage to an 8 month old car by ruining the rear window seals. To their credit they fixed that one for free but they broke one of my windows in the process and made me drive the 400 miles back to them for the service rather than having another dealer local to me take care of it. very mediocre experiences at Dorschel VW in Rochester, NY. Good to know. Hopefully my son never needs anything more than warranty work or normal interval service while he's up there. And yeah, sad that most of the dealers are poor to mediocre. Ide VW in Rochester is supposed to be much better, they were just on the other side of Rochester from me. I'll be checking this when I do my oil change this weekend. I've had a low coolant once at 10k miles but none since then and I'm at 24k. I do top off about once a year. I normally use a fluid extractor for my oil changes but before doing road trip to WITW I will do it the old fashion way so I can check for anything under the car. I installed SuperPro adjustable front end links to get rid of the swaybar preload from installing lowering springs (EMD) a couple of years ago. I didnt follow SuperPro's installation instructions 100% though since they don't provide instructions for my use case: OEM struts with lowering springs. Instead, I had the front end up on ramps so the suspension is loaded (car unsupported). When I removed the OEM end links, there was tension/pre load on the sway bar. I'd say ~12mm. In other words, with the car lowered, the OEM end link can't reach the mounting hole on the OEM sway bar without pushing the swaybar up to reach it. Hence the preload. I started on the drivers side first as they instruct. I removed the extension which they say is only used for stock height. I then lengthened the superpro end link to fit without tension. I then moved onto the passenger side. They instruct mounting the end link on the front side of the strut body. This allows the end link to clear the drive shaft. I adjusted it to fit without tension as well. Then I pulled them both off to compare lengths to each other and to the OEM end links for fun. I mounted them back on but have yet to take a drive. I dont know if the slight preload from using the OEM end links is even noticeable, but I'd rather have it the way its supposed to be. Interested in your thoughts after you drive since I have the same ED Springs and have had the SuperPro Adjustable Front End Links on my list to get. Also good info on how you installed them as I wasn't sure how to go about adjusting them. I went for a short drive primarily to make sure I didn't hear any noises or clunks. I went up/down my driveway a few times at different angles, loaded the suspension on an on-ramp and just drove about as normal. No noises or clunks. But I really can't tell any difference with them on. Maybe more time on the road is needed? Or maybe the preload with the oem links really isn't significant? Regarding installation: So there appears to be conflicting info regarding whether that extender/spacer is needed on the left (drivers) side or not. On a couple of vendor sites, the product info page states: Please Note: Included spacer on end link is to be used on stock ride height cars only. Please remove spacer if using endlinks on a lowered vehicle. 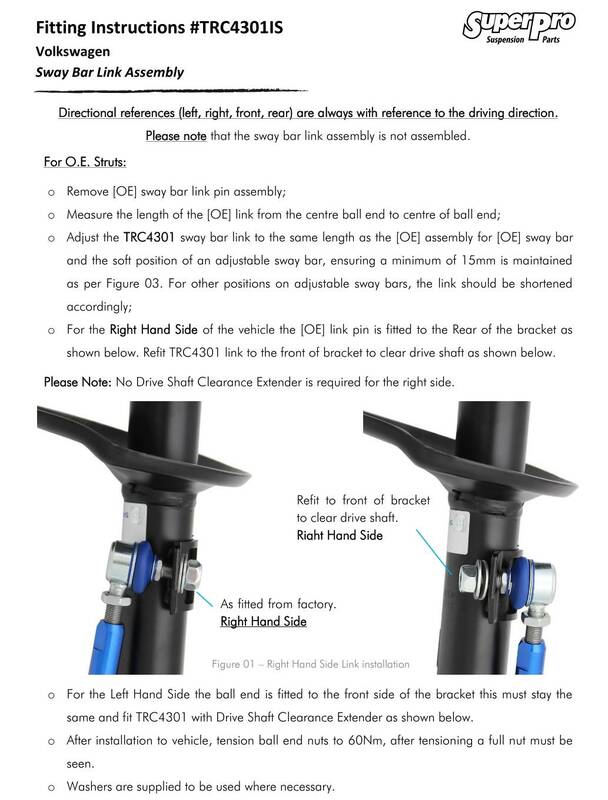 Yet on their installation instructions, it states "For the Left Hand Side the ball end is fitted to the front side of the bracket this must stay the same and fit TRC4301 with Drive Shaft Clearance Extender as shown below" It doesn't mention anything about removing the extender. the Control Arm at full suspension droop needs to be maintained as shown below. I did not install the left side following that process because everything I've ever read about installing front adjustable end links (on any car) say that end links should be adjusted with the suspension loaded to prevent pre-load. The only thing I haven't done yet is put my car on a lift to see if the swaybar hits the control arm at full droop. I don't expect it to. In anycase, I'm planning to do that this weekend. I'll start a separte thread about this as well instead of keeping it here. Ide Volkswagen is the only dealership I sort of trust. 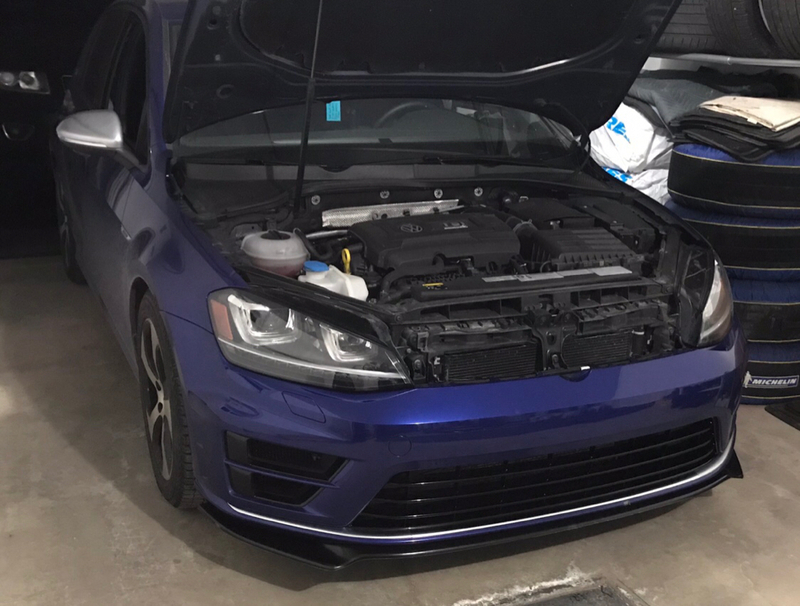 When I had to get my motor replaced at ~9,500 miles on my 2018 Golf R, they didn't care about the aftermarket intake or catback. I did have an audio recording on my dashcam of one of their techs calling me "mister dumb dumb" when talking about what I could have done to kill the motor, which left a quite bad taste in my mouth. Took about a month to get a new motor and install it. I'm avoiding them for all maintenance work for now on, got an appointment planned with The Little Speed Shop up in Rochester for oil, DSG, and Haldex service. I'll only go back to Ide for warranty work. I'm limited on where I can go for work on my R since I live in the middle of nowhere and an hour and a half from Rochester. I'm curious, i did maxton's last summer and couldn't find a way of not having to empty all the windshield washer when removing the bumper. What have you done to prevent it? Yeah i guess I'll do that next time. But i thought that theres a trick more obvious to block the line haha. Yeah, I stopped going to dealerships for anything and everything sans OEM parts purchases if I need things in a pinch locally. It's just not worth the hassle to me for anything other than warranty work. I get the whole "90% of customers who come in here don't know what they're talking about so I might as well ignore everything they say" because for the most part it's true, but the arrogance and immediate wall they always put up assuming that every customer is ignorant is just ridiculous. I do all of my own maintenance and modifications other than things that just aren't fun with only a jack and jack stands, ie my downpipe and clutch which were done by The Little Speedshop and Exit 11 Auto (RIP) respectively. Did you build the block or you running on the stock block till you blow it in a few months?